Atlantic Yards ur-opponent Patti Hagan passed along the program from Borough President Marty Markowitz's August 4 Seaside Summer Concert Series, held in Coney Island. It's a hefty publication, with actual (promo-ish) articles about such things as Brooklyn movies and Brooklyn writers, and lots of ads, including from the many patrons (listed in graphic below), sponsors, and contributors. The pages at bottom show the cover, and the ads from the Barclays Center/Nets and Forest City Ratner. Hagan noted that, at the August 4 concert featuring Aretha Franklin, Markowitz saluted the Nets and Barclays but managed not to mention Forest City Ratner. 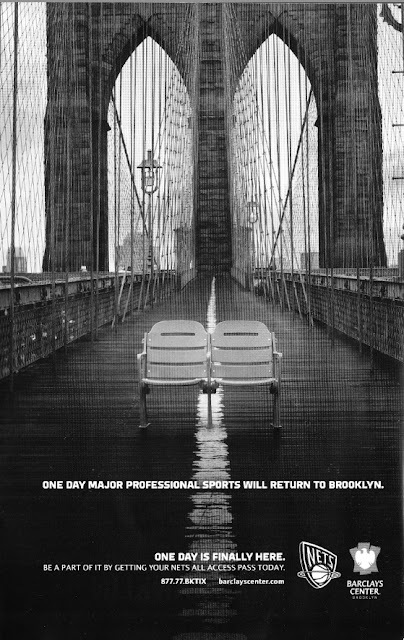 Inside the program, as shown at right, Barclays Center and the Nets are going straight for the Brooklyn Dodgers-Brooklyn Nets connection, positioning an image of seats from a baseball stadium on the iconic Brooklyn Bridge, the gateway to all things Brooklyn. It would be a little more difficult to juxtapose photos of the modest, retro Ebbets Field with the modern Atlantic Yards arena, with its "Barclays Center" signage. Such signage turns a publicly-owned (at least nominally) sports facility into a billboard for a sponsor that bought naming rights that the state simply gave away. Note that some but not all are patrons of Markowitz's other concert series, the Martin Luther King, Jr. concert series, but Barclays/Nets and Forest City are patrons of both. [Updated] The Seaside series, held in Coney Island, is frequently aimed at a significantly white audience, though some nights--such as the Aretha Franklin concert and a concert featuring Latino acts--it's not, and Markowitz's VIP section confirms that, Hagan observes. The MLK series, held in Crown Heights, is aimed at a significantly black audience, though it appeals to a broader crowd. Given Markowitz's trips to Turkey and affinity for things Turkish, including promotion of a Turkish company's bid to build new taxis in New York, perhaps we shouldn't be surprised that a disproportionate number of restaurants buying ads in the program feature Turkish cuisine: Liman Restaurant in Sheepshead Bay; Taci's Beyti in Midwood; Ali Baba at two Manhattan locations (! ); and Sahara Restaurant in Gravesend. All but the two restaurants in Manhattan are more or less on the way to the concert location. There were only three other restaurant ads in the program: Gargiulo's in Coney Island; Surf & Turf Grill in Coney Island; and Marco Polo Ristorante/Enoteca on Court in Carroll Gardens.